Surgical Monitoring Mouse and Rat made easy. ECG; Ultra low-noise, high resolution;Simultaneous Lead I, II and III; 24-bit sigma-delta AD converters. 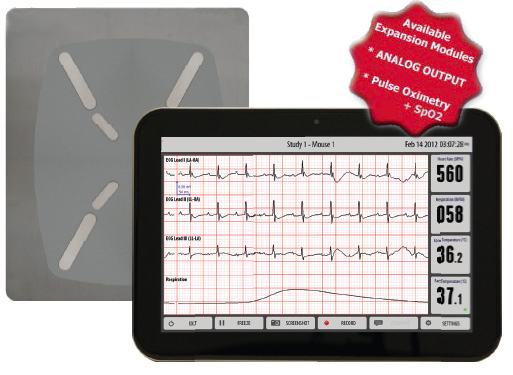 Heart Rate; real-time numeric display; Up to 999BPM; Acquired from ECG waveform. Pulse Oximetry; Ultralow-noise, high resolution; Simultaneous SpO2 display; 18-bit sigma-delta AD converters. 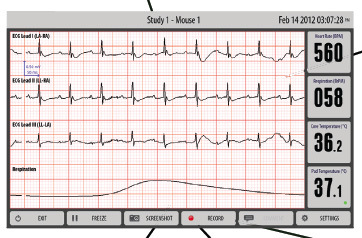 Respiration; Ultra low-noise; high resolution; Based on thoracic impedance; Signal acquired through ECG electrodes. Breath Rate; Real-time numeric display; Up to 300BrPM; Acquired from respiration waveform. Core temperature; 0,1˚C monitoring accuracy; Mouse-specific rectal probe. Warming; Elctronic closed-loop control; Intelligent zone heating; Platform temperature control with 0,1˚C resolution. 25,5cm Touch screen; Capacitive touch screen works with surgical gloves. Ergonomic Display; Waveforms and nummeric data presented in an easily readable format. Comment; Apply notes, tags, and observations to mark events. Record and Export; Supports many analysis packages through CSV export. Screenshot; Take quick snapshots to capture interesting data. Accessories; Frame designed for magnetic acessories. 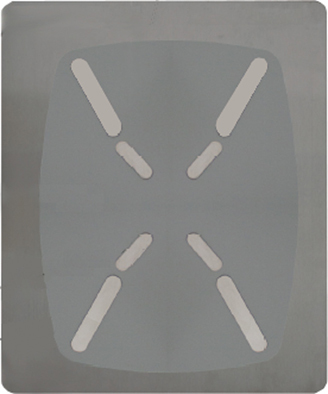 Durable; Easy to clean stainless steel work surface and electrodes. Warming Zone; Homothermic heater maintains core temperature. ECG Electrodes; Surface-mounted mouse & rat electrodes enable easy operation with low noise. Very detailed information on the MouseMonitor can be downloaded here!